Little Red Schoolhouse – A Memoir That’s Not Quite Right! 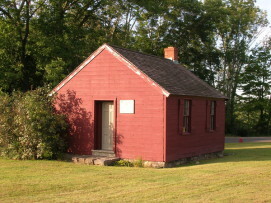 I learned a little about the history of 1-room schools on the radio show “Backstory with the American History Guys.” http://backstoryradio.org/ This is one of my favorite programs as I just love it when the historians set the record straight – on all kinds of subjects! In a show titled “School Days: A History of Public Education,” the history experts, Peter Onuf (18th century guy), Ed Ayers (19th century guy), and Brian Balogh (20th century guy), discussed the “little red schoolhouse” in our nation’s history. Unfortunately, our “memory” of the 1-room school, doesn’t quite match with history. 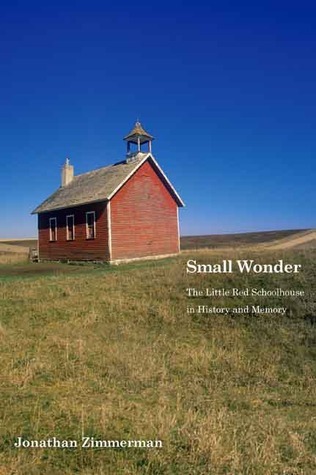 The radio program consulted with Jonathan Zimmerman, author of “Small Wonder: The Little Red Schoolhouse in History and Memory,” an expert on the subject. I was particularly interested in this program as I grew-up in New England where dilapidated 1-room schools dotted the countryside. The school that I would have attended is still (partially) standing, although the roof is mostly caved in. Another 1-room school in town was preserved for historical purposes. It is currently located on the grounds of the Middle Gate Elementary School in Newtown, CT. (see picture above). When I was growing up in the 70s, there was even one old man in the neighborhood who had attended the nearby 1-room schoolhouse as a child. However, I must say that despite the prevalence of the 1-room schoolhouses in the area, I never once thought that I wanted to trade my modern school for the nearby schoolhouse. My modern school had bus service, all-year round! I may have been a practical child, but as Jonathan Zimmerman and the History Guys pointed out, our nation’s memory of the 1-room schoolhouse has almost always been nostalgic. It distorts the past, leaving out the bad characteristics and keeping the good ones. In truth, 1-room schools, serving mostly rural America, had plenty of problems. 19th century schools were made of different materials depending on the area. “Log schools were built for convenience, not comfort. Woodsmen stacked unhewn logs and stuffed mud, clay, moss, or straw into the spaces between them; they left a few square holes for window, which were covered with blankets, animal skins, or greased paper. Sometimes they lined the dirt floors with straw, which kept bare feet warm in the winter but also provided a perfect breeding ground for fleas.” Other schoolhouses suffered from dilapidated roofs and/or broken windows. While the school structures suffered from the elements, so did the students. The school was often cold and a pot-bellied stove only offered some relief, smoking terribly if the school was forced to burn wet wood. Water was a scarcity too, and the boys and girls often drank from a shared bucket of water. Zimmerman writes “Once they got inside, students encountered a floor plan that was every bit as simple and predictable as the schoools’ exterior. Built-in writing desks with backless benches lined three walls of the room; children faced the wall when they wrote and swiveled around to see the teacher.” The instruction method, rote memorization. Discipline was enforced by corporal punishment. While the severe punishment was accepted as common practice, some schoolmasters became especially violent or sadistic, which often led to an escalation of bad behavior as the “bad boys” fought back. So, do you have a different vision of a 1-room schoolhouse? 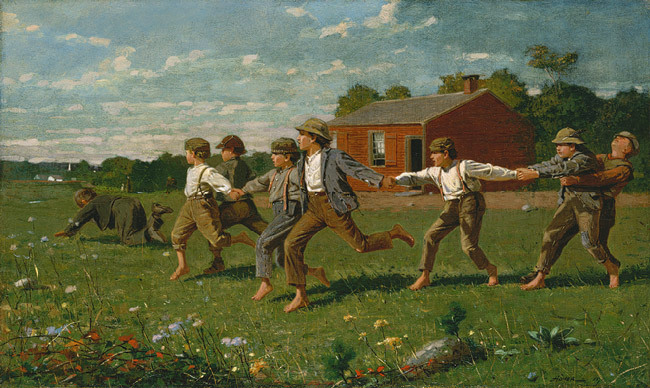 Zimmerman and the history guys explain that that those images may have come from Hollywood’s “Little House on the Prairie,” Winslow Homer’s “Snap the Whip,” or the iconic tune “School Days,” none of which portray the 1-room school as it actually existed for most of America. While most of the memoirs from people who taught or studied in 1-room schools suggests inadequacy (and sometimes suffering), our collective memory suggests otherwise. We prefer to adopt the nostalgic version of a 1-room school house versus the historically correct version that includes a heap of problems. Can a ‘thing’ have a memoir? We remember “little red schoolhouses” through the writings of people who experienced them, but also through the lens of people who didn’t. For example, Gus Edwards, the man who composed the song “School Days” was a German immigrant who spent most of his life in New York City, far away from a country 1-room school. The little red schoolhouse couldn’t write its own song, so someone, without any knowledge of the subject, wrote one for it! If the schoolhouse could write, or compose, what would it say? Would it embrace its glowing persona that has been embraced by popular culture? What human wouldn’t want to be remembered for only their good qualities? However, if the little red schoolhouse was really an institution of learning, it would probably insist that we get our facts straight and remember it accurately, both good and bad traits alike. I applaud the notion! Zimmerman’s book is fascinating and I highly recommend it to anyone interested in education or American history. If anything, he explains why the “little red schoolhouse” became an American icon. I don’t want to spoil the book, but most “little red schoolhouses” weren’t even red!